The Agriculture-Entrepreneurship Series provides education to entrepreneurs who want to begin a farming business and to farmers wanting to transform their farm into a thriving business. The 4-part series includes real-world scenarios and hands-on activities. Each session features an education session, facilitated by Arlene Childers, along with a local agriculture expert guest speaker. Registering for all four workshops is HIGHLY recommended. The four workshops take place on Thursdays from 6-8, beginning in January at the Agricultural Conference Center in Boone. Register on the CCC&TI website for workshops individually HERE or use links for sessions following descriptions below. Arlene Childers is the owner of Going2Win Consulting. Formerly the Assistant Director at NC REAL Entrepreneurship, Arlene is a REAL certified facilitator and has offered REAL at the Middle School, High School, and Community College levels. Arlene has directed REAL Institutes and helped develop and deliver the REAL Entrepreneurship, REAL Agriculture, and REAL Youth curriculums. Arlene worked in the technology field for fourteen years as a Computer Programmer, Project Manager, and Director of Information Systems. She has a B.S. in Computer Science from Appalachian State University and completed her Masters of Entrepreneurship from Western Carolina University in May, 2013. The Agriculture-Entrepreneurship Series provides education to new and existing farm entrepreneurs. In this seminar, attendees will identify the personal qualities and skills of successful entrepreneurs, and learn about community analysis and business feasibility. Participants will identify tools necessary to write a successful business plan to serve as a guide for their business. Carol and Lon Coulter own and operate Heritage Homestead Goat Dairy. They have been licensed as a Farmstead Dairy since 2009. Lon makes the cheese and Carol manages the herd, does the finances and the marketing. They sell their cheese at Framers Markets, in Health Food Stores, Wineries and to Chefs. IN addition to cheese they raise chickens for eggs and pigs for pork. Carol currently works off the farm at National Committee for the New River as Director of Operations where she manages the finances and oversees programming including Advocacy, Restoration and Land Protection. Carol previously managed the development of Family Central including the commercial kitchen. In this seminar, attendees focus on the importance of market research and target market when developing a marketing plan. Learn how Marketing Mix decisions can be made using the 5 P's of Marketing. Attendees identify target market segments and develop a marketing strategy for a sample business using SWOT Analysis. 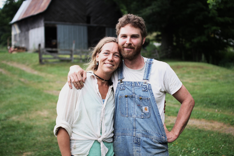 Hollis Wild has worked with farmers for the last 10 years, the last 3 of those working with ASAP (Appalachian Sustainable Agriculture Project). Through her work with ASAP she helps connect farmers, restaurants, and farmers markets with ASAP’s programs including Appalachian Grown (AG) certification and promotional materials. She also helps connect farmers with markets and helps restaurants source local food. Hollis and Jay Wild operated a small flowering tree and shrub nursery for 30 years and now sell herbs plants and produce after recycling the use of their greenhouses. In this seminar, attendees will identify key human resource concerns, discuss different forms of legal structures and the advantages and disadvantages of each type of structure. Additional topics include licensing and zoning, trademarks, copyrights, patents, and insurance. Holly Whitesides and Andy Bryant have been farming together since 2010. Growing food has always been a shared passion, which continues to manifest in amazing ways! In addition to farming full-time, Holly also teaches yoga at Neighborhood Yoga in Boone, NC. Like many small farmers, Andy works off the farm at WAMY Community Action as the weatherization program director. Learn the various alternatives to financing a small business and the risks involved. The seminar introduces breakeven analysis as a tool to assist the entrepreneur in measuring financial feasibility. Activities identify the kinds of data needed to project the revenue, start-up, and operating costs of a business. The seminar helps attendees develop an understanding of cash flow and break even analysis and its relationship to business planning. Barbara Smith was raised on a farm deep in the mountains of North Carolina that has been in her family since the late 1700s. Barbara began her service with USDA after obtaining her Bachelor’s degree in Animal Science from North Carolina State University in 1977. For the past 37 years she has made and serviced farm loans to a variety of farmers and on many diverse farm operations. Farm business planning, coupled with providing guidance on production management practices, encompass Barbara's day-to-day job activities. Our district (WNC) was fourth in the nation this year in making loans under the new USDA Microloan program.